January 30th, 2016 should be the biggest Top A Top to date. Going on the feedback and the massive promotional team behind this clash the support is looking real good. Top A Top has come on a long way since Sovereign Sound became the Top A Top Champion after clashing with Flava Sound. That was the clash that kicked off the now popular brand. Venus World Class was a popular addition to the Top A Top Brand. They defeated Rolex Sound and LPOJ. Putting the music part aside Venus World Class Sound has a massive fan base in around Luton. 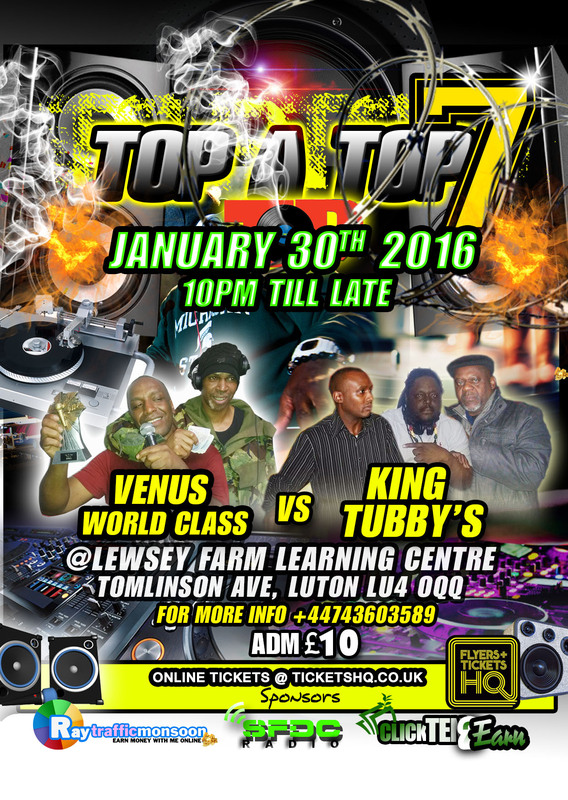 King Tubby Sound became part of the Top A Top brand when Scrappy Forde MC was passing through Luton and I took the opportunity to invite them in so that the brand can get more popular quickly. What a great and exciting clash this is going to be. 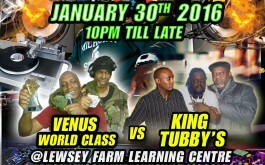 King Tubby with all their skills, experience and support against Venus with their massive fan base and tunes to back it as well. May the best sound be the winner. Be there or be nowhere.